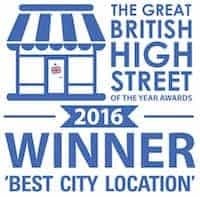 Discover the Cathedral Quarter, voted Britain’s ‘Best City Location’, with a rich tapestry of culture and heritage and home to a fantastic and diverse range of independent and national businesses. Click here for a comprehensive listing of Cathedral Quarter businesses. Information on things to do, festivals and events in the Cathedral Quarter. All the latest business offers and how to apply for your loyalty card. Getting to the Cathedral Quarter is very straightforward – find out how here. There is plentiful parking in and around the Cathedral Quarter – find out where. All the latest news from the Cathedral Quarter. Derby’s Cathedral Quarter provides a memorable visitor experience for all. Renowned for its friendly atmosphere and scenic historic surroundings, the Cathedral Quarter is home to quality shopping, business services, health & beauty establishments and an abundance of bars, restaurants and entertainment venues, with a plethora of events throughout the year.